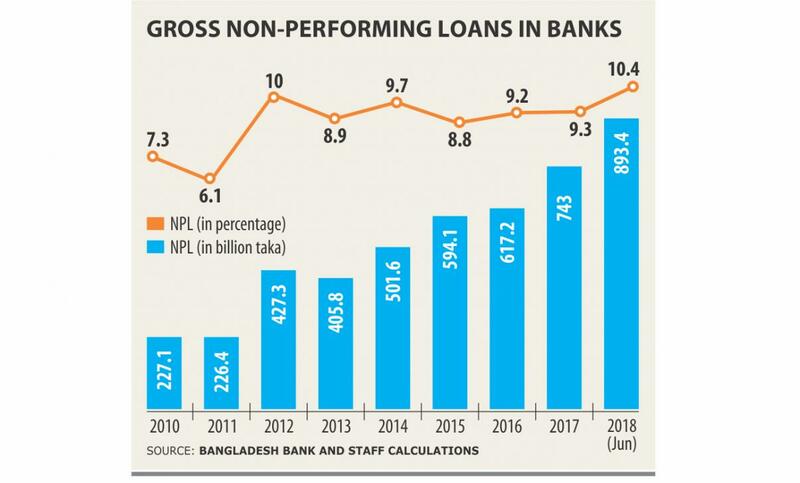 The pace of recovery of banks’ non-performing loans (NPL) was much lower than the rate at which their NPL increased last year, according to the statistics of the central bank of Bangladesh, the Bangladesh Bank (BB). 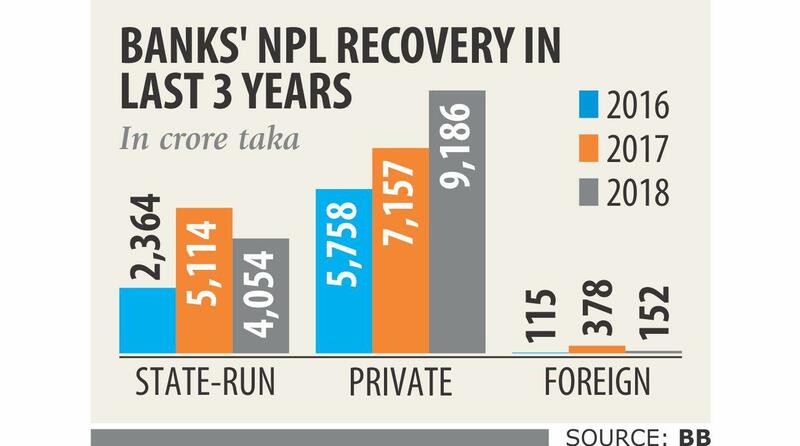 In 2018, banks recovered BDT 13,392 crore of NPLs, up 5.86 percent from a year earlier, while delinquent loans in the sector soared 26.38 percent to BDT 93,911 crore or EUR 9.935 billion, according to the central bank data. In this circumstances, the government’s latest move to amend the existing loan rules to extend more facilities to defaulters will only exacerbate the situation, said Mr. Khondkar Ibrahim Khaled, former deputy governor of the central bank of Bangladesh. Last week, the government announced that defaulters would be allowed to reschedule their loans for 12 years after furnishing 2 percent down payment under a special package. At present, defaulters can reschedule their loans for at most 3 years by providing 10 to 15 percent down payment. Both small and large borrowers will be able to get the rescheduling facility and a 7 percent simple interest formula instead of existing compound formula will be applied. If their payments are regular, borrowers will also be able to get fresh loans from the same bank after rescheduling. “Only those with genuine reasons for becoming defaulters can avail the facility,” Finance Minister Mr. AHM Mustafa Kamal told reporters last week after the meeting where the decision to amend the rescheduling rules was made. The definition of genuine reasons was however not elaborated. The discretionary measure will only widen the scope for unethical bankers to facilitate delinquent borrowers in exchange for favours, said experts. The Finance Minister of Bangladesh Mr. AHM Mustafa Kamal informed the parliament on the 28th April 2019 that there were 266,118 loan defaulters in the country as of December 2018. A High Court order, however, prevented names of some defaulters from being published, noted the finance minister. The top 20 defaulters, as per the Credit Information Bureau of the central bank of Bangladesh, are Quantum Power System Limited, Samannaz Super Oil Ltd, BR Spinning Mills Limited, Suprov Spinning Limited, Rimex Footwear Ltd, Rising Steel Limited, Computer Source Limited, Benetex Industries Ltd, Max Spinning Mills, SA Oil Refinery Ltd, Rubya Vegetable Industries Ltd, Anowara Spinning Mills, Crescent Leather Products Ltd, Suprov Rotor Spinning Limited, Yasir Enterprise, Chowdhury Knitwears Ltd, Siddique Traders, Rupali Composite Leather Wear Ltd, Alppa Composite Towels Limited and MM Vegetables Products Ltd.
On the March 01, 2018 the Daily Star newspaper reported the amount of loan defaults of Mohammad Ilias Brothers was BDT 889.49 crore, Quantum Power Systems Ltd BDT 558.9 crore, Jashim Vegetable Oil Ltd BDT 547.95 crore, Max Spinning Mills BDT 525.60 crore, Benetex Industries BDT 516.94 crore, Dhaka Trade Housing BDT 485.29 crore, Anwar Spinning Mills BDT 474.37 crore, Siddique Traders BDT 428.57 crore, Yasir Enterprise BDT 414.80 crore, Alfa Composite Towels Ltd BDT 401.73 crore, Legend Holdings BDT 347.85 crore, Hallmark Fashion Ltd BDT 339.34 crore, Mac International BDT 338.74 crore, Monno Fabrics BDT 338.37 crore, Fair Trade Fabrics BDT 322.4 crore, Saharis Composite Towel BDT 312.96 crore, Nurjahan Super Oil Ltd BDT 304.49 crore, Keya Yarn Ltd BDT 292.53 crore, Saleh Carpet Mills BDT 287.1 crore, Fair Yarn Processing Ltd BDT 273.16 crore, SK Steel BDT 271.48 crore, Chowdhury Knitwear BDT 269.38 crore, Help Line Resources Ltd BDT 258.30 crore, Six Seasons Apartment Ltd BDT 254.57 crore and Bismillah Towels Ltd BDT 243.84 crore. “Recovery of bad loans is a very tough job in Bangladesh and it is tougher for state-owned banks,” said Mr. Khaled, also a former chairman of state-owned Bangladesh Krishi (agricultural) Bank. Data also validated his claim as loan recovery by state-run banks in 2018 was only BDT 4,054 crore, down 21 percent year-on-year. On the other hand, private banks recovered over BDT 9,185 crore, up 28 percent from a year earlier. The state-run banks have weaknesses including poor governance, bad selection of borrowers, inadequate monitoring of loans, insufficient collateral against loans and lacklustre recovery efforts, he added. “Cash recovery by private banks was not good enough considering the volume of their default loans,” said Mr. Syed Mahbubur Rahman, chairman of the Association of Bankers, Bangladesh, a platform of private banks’ chief executive officers. The authority concerned should offer judiciary support to banks to recover NPLs as wilful defaulters often file writ petitions with the High Court and get to lift their default status, said Rahman, also the managing director of Dhaka Bank. Foreign banks recovered BDT 152 crore last year, down 60 percent year-on-year. Some bankers wishing not to be named said if lenders had followed the rules and regulations properly while rescheduling default loans, recovery would have been much higher. Lenders must take down payment of 10 percent to 50 percent of the outstanding loan amount for rescheduling of NPLs, according to the central bank’s instruction. But banks do not follow it, they said. In 2018, lenders rescheduled a record amount of default loans worth BDT 23,210 crore, up 22 percent from a year earlier. “Continuous follow-up is essential to speeding up the cash recovery from default loans. Lenders should select proper borrowers to ensure the recovery of default loans,” Mr. Rahman said.